I was inspired by the graphic design and the colors. 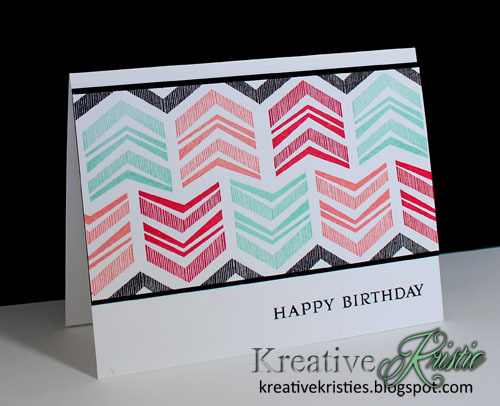 I used PTI's set Ribbon Slider Sentiments and Keep it Simple: Birthday II. You ROCK the inspiration piece, Kristie! This card is awesome! Kristie! REally pretty ... both the card, and the shirt! Your friends totally steered you in the right direction! That's a really cool shirt AND a really cool card! Has a bit of an Aztec feel/look. The ink colors you used on your card are perfect match! What a pretty shirt and card. Love the colors. You rocked this challenge!! Great take on your top. Lovely shirt and card. Cool pattern! I love the colors you chose. Love the card and a great inspiration piece! Oh my goodness!! One word for this card... FABULOUS!! Cool card, cool garment - now we want a picture of you wearing it! Fantastic design & casing your fun shirt! Oh wow is this ever fabulous!! Great stamping!